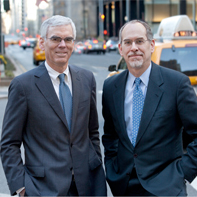 We are pleased to announce that Ira Block has joined the firm as Counsel. A former federal prosecutor and general counsel and an accomplished commercial litigator, Ira strengthens the firm’s offerings in business litigation, corporate compliance, and regulatory and internal investigations. From his experience as general counsel of New York City’s Off-Track Betting Corporation, Ira possesses extensive knowledge of gaming and racing law and regulation and will continue his advisory work in those fields. Ira served as an Assistant U.S. Attorney in the Southern District of New York for nearly 10 years under four U. S. Attorneys and held leadership roles as Deputy Chief of the Criminal Division, Chief of the Official Corruption/Special Prosecutions Unit, and Senior Litigation Counsel. Ira received his A.B. from the University of Rochester with High Honors and his J.D. from Yale Law School. Please click here for Ira’s bio.